My air conditioner makes noises. What's wrong with it? 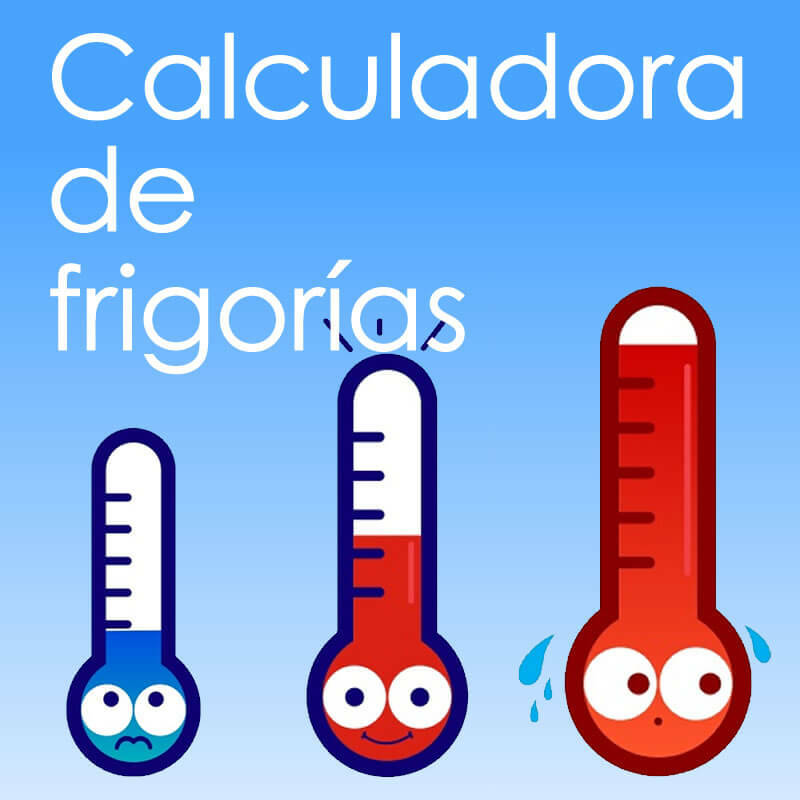 Esta usted en Aire acondicionado » My air conditioner makes noises. What’s wrong with it? 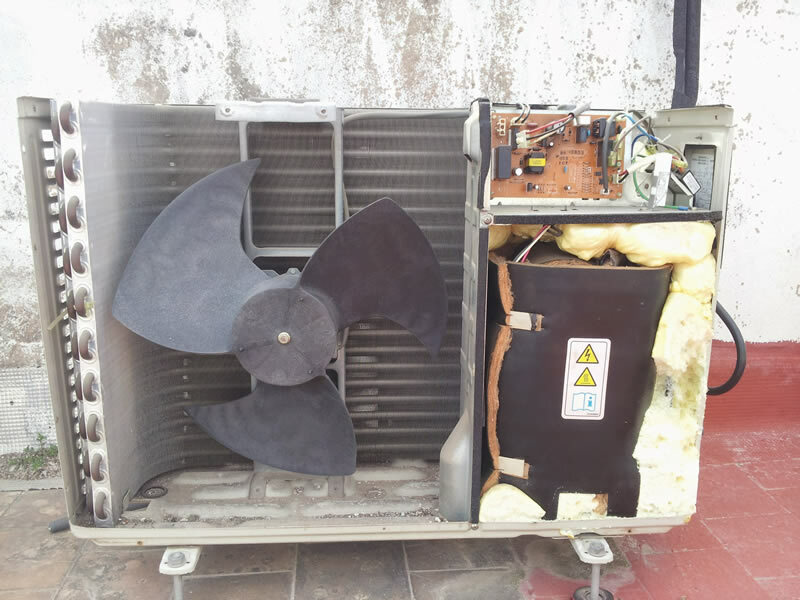 Due to the special characteristics A/C units have compared to another kind of electrical appliances, the first ones are very likely to show noises and vibrations as in the internal unit as in the external one, this happens because of the expansions produced by temperature differences reached in both units and the existence of moving pieces in the internal unit, such as compressor, engine, etc. In general, the noisiest piece and the one which makes the vast majority of vibrations is the external unit is used to be the compressor, nevertheless, with the inverter units’ arrival, the noise has decreased considerably, though this component is still being the one which generates the most part of the noise in our A/C. Let’s see now why these noises can be produced and how to solve them. There are many chances to appear undesired and disturbing noises in the external unit of our A/C. This is pretty normal, as we said before, because of its moving components and besides, this components are made of iron, in comparison to the internal unit components, which are made of plastic. 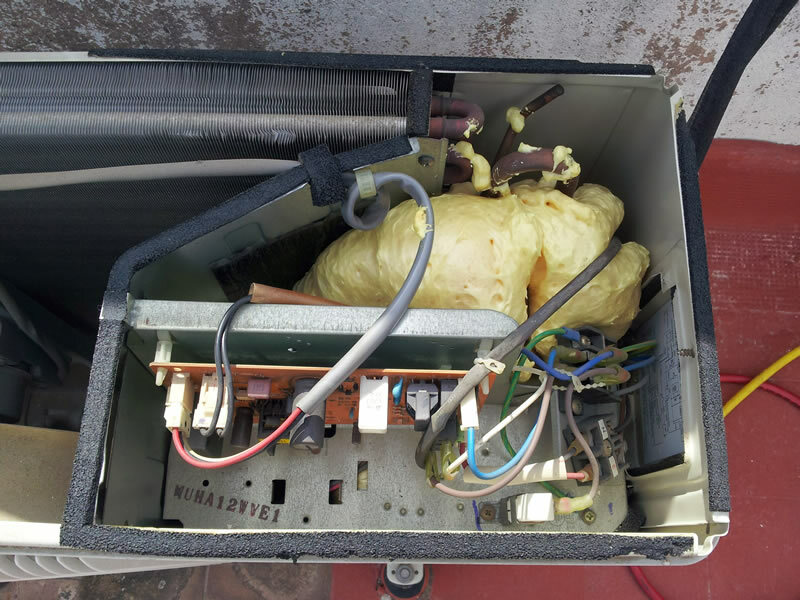 Noise in the external unit because of loosing the external fan nut. It may be something weird, but it’s not that weird the fan sails get loose from the engine’s axle of the external fan because they aren’t anchored to anything and they slide forward, even hitting against the protective fan grating. In order to fix it you can only have to look for the dropped nut and put it again back in place or put a new one if we don’t want to open the external unit or we can’t find it. This nut is 6mm long. Something pretty usual is the sails get broken, by accident or not (imagine a child puts a stick when the machine is on). 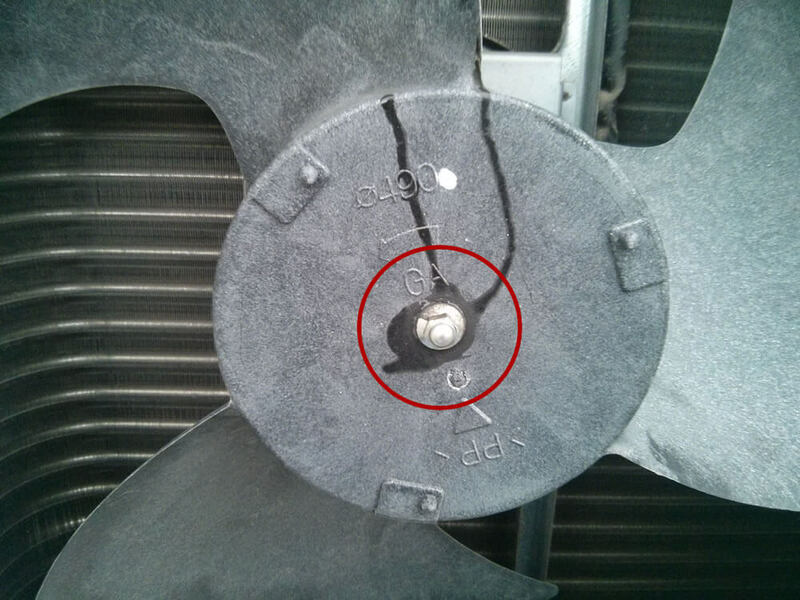 If any sail breaks the fan will run in an erratic way and depending on if they are broken a lot or not, they will spin oddly, making noises and arriving to break down the fan engine. To fix it, we just have to change sails for a new ones. Noises in compressor are another typical kind of noise problems in our A/C unit, as we explained previously, with the inverter technology apparition and fresh new compressors, this kind of noises has decreased in a significant way but still, we don’t have to forget that we are talking about an engine which works with high pressure and therefore it’s logical it makes a little noise. The thing is deducing that a compressor makes much noise than usual is something complicated unless we were used to the normal sound and suddenly it made more noise. These cases are pretty uncommon and they are due to the compressor itself is badly preserved. The only solution is to change the compressor for a new one, because they can in no way be fixed. Another explanation why the compressor makes noise and vibrations is that silent blocks where it lies have worsen a lot and compressor is pressing the base of the machine. In that case, we can put a rubber piece between compressor and the base of the external unit in order to solve these vibrations and noises, or we can call SAT in order to change silent blocks, which is something rather advisable. The most common noise, and also the most unpleasant and very difficult to eliminate sometimes, a metallic noise, a repetitious one, like two sheets vibrating over and over which gets stuck in our heads and the neighbors’. These metallic noises can be differenced into two categories: the ones produced inside the external A/C or the ones produced in the external part of itself or in its casing. This noise can happen when two copper pipes crash each other or when a copper pipe and some sheet from the external unit crash. It’s an easy-to-solve noise, but to do that we have to open the external unit, once opened we will have to check the machines’ inside, where compressor and a few copper pipes are. There, we should look for two pipes touching or crashing each other. Once located, we have to separate one from the other or put some sort of rubber piece between them in order to not vibrate. By doing this, we will solve the metallic noise and we will also have solved a leaking gas problem for these vibrations between two pipes use to end in this leaking problem. The external noise is also a very easy to solve noise but also a very complicated one other times. These noises are produced by crashing two casing sheets from the A/C itself and though sometimes it’s easy to solve as tighten a screw, in other occasions it will be necessary to turn on the unit and go checking where the noise appears. 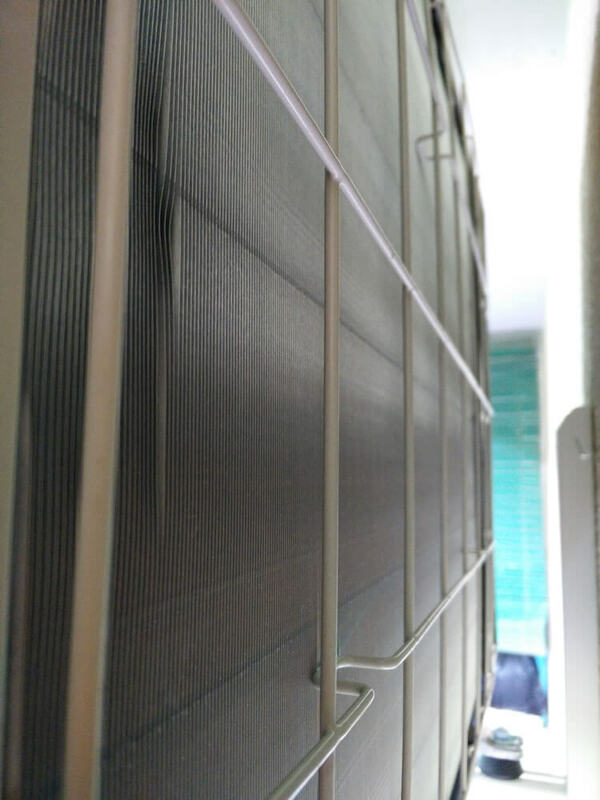 Sometimes, the noise appears in the machine back grating, a grating which protects the external heat exchanger and it protects ourselves as well, for the fine aluminum from what the grating is made of can cut us easily. If that’s your case and the unit is located in a place where nobody is going to touch the machine or there aren’t any possibilities to be cut, the best solution is to remove the grating and that’s all; as we said before, this grating has no essential function in our machine and it’s going to run whether we have the grating or not. Filling the machine with polyurethane foam isn’t going to solve the noise problem and the external machine will be impossible repaired. Once we have seen the chances and noises than can be produced in the external unit, we are going to see why the internal unit of our A/C makes noise. We can split noises in the internal unit into two possibilities: the ones produced by the ventilation gear or noises produced by internal unit casing. We call ventilation gear the whole inner fan engine and sails of the fan engine itself. This two components go separately and they join each other by an engine and a screw inside sails. They can be bought and substitute them independently one from the other. Let’s see why they can make noise. Noises in sails can be produced by many reasons, we may have broken sails, or not entirely but some part of them. These sails are put together by wings section and these, like the external fan sails can be broken because of natural reasons or materials wear or accidentally (child + stick = broken). To see if that’s the reason, we have to turn off the internal unit and with a torch see how sails are and check if some wing is missing, we should spin with a hand or something we could use to see sails completely, given that they may appear well but it may be broken on the back. It may happen something is inside the sail and got stuck on it, sometimes a piece of paper or plastic goes into the sail and this by spinning at a high speed hits the casing of the machine and makes noise. It’s not that common, but if it happens, to check if that’s the problem, we should proceed the same way as we did before. It also exists a noise like a cricket in the A/C inner units, this is usually made by the roller ventilation gear of the inner unit; this roller is located on the left side of the machine and it’s where the ventilation gear is anchored; on the right side it will be anchored by the engine itself. In some occasions this roller makes noise when it has run out of lubrication. To solve that we will have to disassemble that roller and grease it a bit. 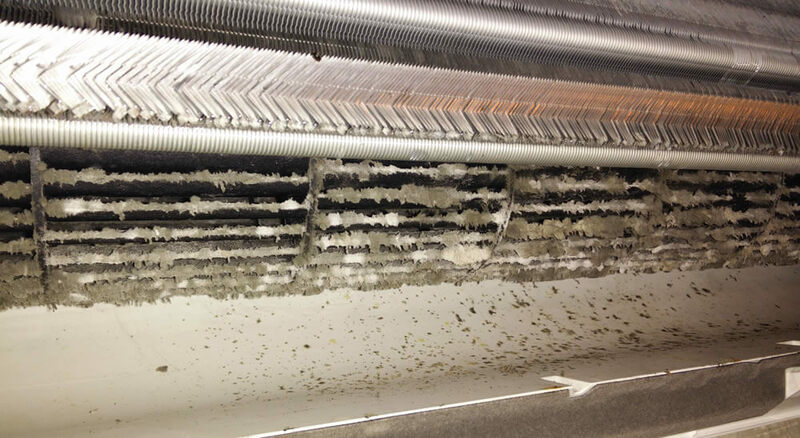 Dirty fan or dirty sail, another cause of noise in the internal unit may be produced because sail is very dirty and given that the constant air flux can’t go through all the surface of the inner fan sail, it dislocates itself and makes noise. In order to fix it we just have to clean it. Remember that a good maintenance is essential for mitigating those problems an avoiding bad smells. Though we are talking about a problem which comes from the inner fan engine, this noise won’t be heard in the engine itself but in the sail. This problem appears because the engine axle decentres making the sail to spin oddly and making noise. How can I know if the engine is decentred? To fin out if the engine’s axle is badly preserved we are going to do this: we are going to turn on the internal unit in ventilation mode and with a torch we look if the sail spins well or if it spins in leaps and bounds. If it’s doing this, the most common thing is that the engine is badly preserved and the axle a bit bent. In order to fix it, it’s advisable to call SAT, though changing an inner fan engine isn’t very complicated but it’s necessary to disassemble all the inner unit. 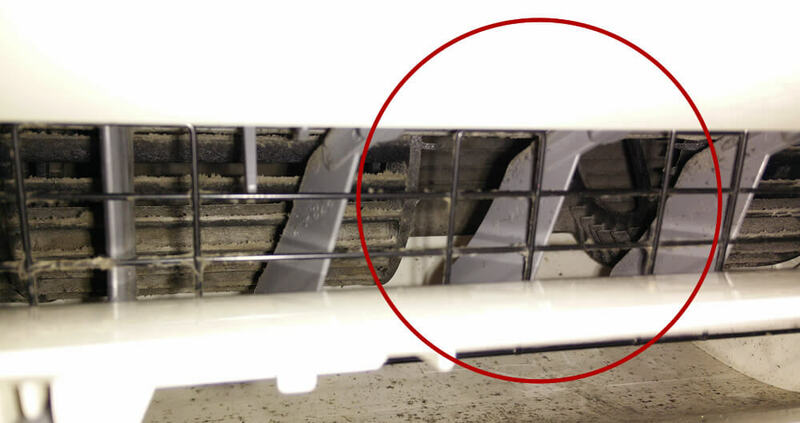 Another one of the possible causes of noises is because the unit’s casing itself, these noises are much common in cheap A/C units because the plastic in which they are made of aren’t high quality. But why these noises are produced? These noises use to appear when the unit is running in heat mode and in the beginning of that mode. Noises are made due to the expansion of plastics. When this mode is run, the internal unit goes from 20º C to 50º C in a few minutes. This makes the plastics to expand and in many occasions we can hear “crack” noises, which sometimes we think the unit has broken given those strong noises. There is no solution, though we may try to avoid or diminish this noise by disassembling and assembling again the internal unit casing if we think when it was installed it wasn’t put correctly. This noise is pretty usual too, it’s a noise we hear in the internal unit but, in fact, neither the internal unit itself nor the external unit have nothing to do with it, it’s a noise produced or than can be heard mostly at the beginning of our A/C running. It’s caused by a bad gas passing over the refrigerating circuit, like an obstruction, a flattened tube or a bad expansion valve working. The solution may not be that easy, in some occasions by changing the expansion valve, if the repairman decides the problem is there; in other occasions the installation will have to be checked in order to find out if a tube has been flattened, making this way the noise. Sometimes there may not be a real problem, just being necessary to augment the copper installation distance, because a short one can make that gas passing noise, happening when the installation is less than three meters long, generating high speed gas and therefore that kind of noise. In order to avoid it, it is used to enlarge the tube behind the external unit in order to decrease gas’ speed.. 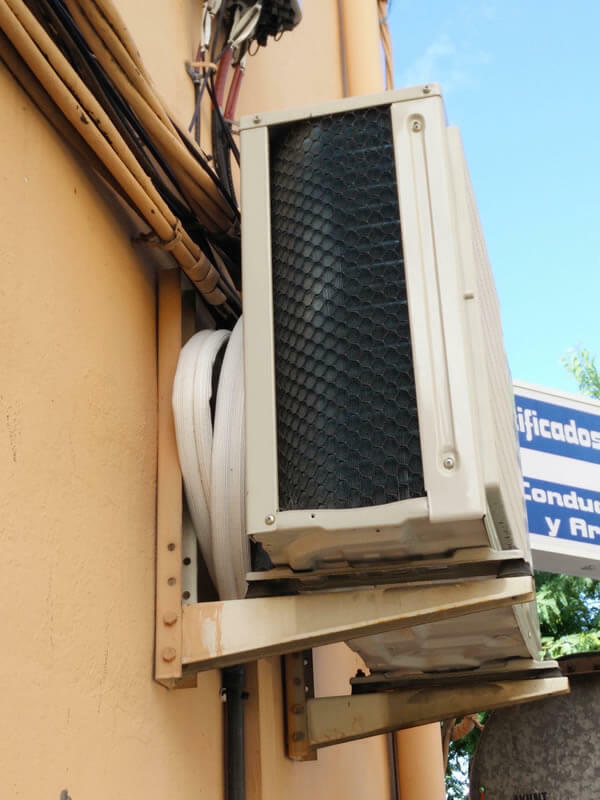 In order to solve a gas passing noise in an A/C which has a very short installation, the most common thing to do is to revolve the tube in the back side of the external unit.